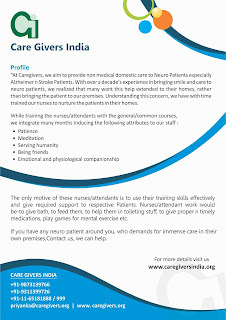 Alzheimer's Disease in India: Care Givers India, New Delhi. Care Givers India: "Nurses/Attendants work would be to give bath, to feed them, to help them in toileting stuff, to give proper and timely medications, play games for mental exercise etc." Thank you for sharing your experience with us on our Facebook group. I am sure the other Caregivers facing similar situations there would be very moved to see all your efforts in making your relative feel comfortable through the disease. Indeed, each testimony is important for us because other Family Caregivers in India may find the support and relief they need, benefit of your "advises and tips" and you may even enlight their pathway. Thank you for bringing hope by participating even if you don't have a serious issue but even just feelings/thoughts are worth to share. It is really helping us in raising awareness on this disease, bring support and knowledge for Dementia Care Management in India.